The Department of English enrolls more than thirty students in its Master of Arts Program. Students, in consultation with their advisor, tailor their course schedules to their own career objectives and interests, selecting a variety of courses in literature, linguistics, rhetoric and composition, literary theory, cultural studies and professional writing. More of what to expect from this course of study on our Student Learning Outcomes (SLOs) page (opens as a PDF). See our brochure here (opens as a PDF) or take a look at our video that shows how universal and useful a graduate English degree can be. Teaching Assistantships in the amount of $13,000 are available and are awarded on a competitive basis each Spring to the top five or six candidates among the applicants who submit their complete application by the deadline and plan to enter the program the next Fall. These assistantships are renewable for a second year, assuming satisfactory performance, which includes successfully completing 18 hours of graduate-level coursework. Teaching Assistants receive training in the teaching of writing and work approximately 20 hours per week, tutoring students in the Writing Center, assisting in faculty's 101 and 201 classes, assisting program coordinators, and eventually teaching English 101/201. Applicants interested in being considered for an assistantship should check the appropriate box on the application form; there is no additional paperwork to fill out. A variety of other scholarships, including the New Scholar Award, are available for qualifying students. Awarded each year to an incoming graduate student in English working toward an M.A. degree, the award provides funds to be used towards in-state tuition, fees, and books. The award shall be evenly divided between Fall and Spring semesters. 30 of the required 36 hours must be taken in residence. All students are required to take English 501: Introduction to Research Methods in English. In addition, all students are required to take either English 502: Introduction to Literary Theory or English 552: Rhetoric and Culture. Beyond the two required courses, students are encouraged to consult with the Graduate Coordinator to tailor their program of study to their personal and professional needs. Students may select a thesis or non-thesis option. Students pursuing the thesis option must complete 30 semester hours of graduate course work, register for ENG 599 thesis (6 hours) in their last two semesters, and present and defend a thesis, acceptable to the student's thesis committee, prior to graduation. Students pursuing the non-thesis option will complete 36 hours of graduate course work. As many as 6 of the 36 hours may be transferred from another regionally accredited institution, subject to the approval of the English Department's Graduate Coordinator. 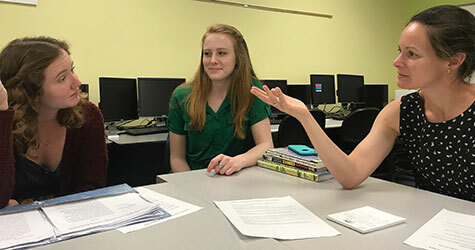 A student enrolled in the UNCW English Graduate Program who wished to take one or more graduate English courses elsewhere for graduate credit must obtain prior approval from the Graduate Coordinator and the Dean of the Graduate School. Students may substitute one course (3 hours) from outside the department for an English course with the prior approval of the Graduate Coordinator. Students must successfully complete a qualifying written comprehensive examination. Normally the examination is taken in the third semester of full-time enrollment. All degree requirements must be completed within five calendar years. the department; these should be sent to the The Graduate School. Forms for international students, certification, registration and requests for travel and other activities. The link here will open a pdf form to apply for a Graduate/Independent Study opportunity. Find out details of applying to graduate, along with a checklist and dates and deadlines. The following contains the information graduate students should look over if they are looking to be reimbursed for travel.